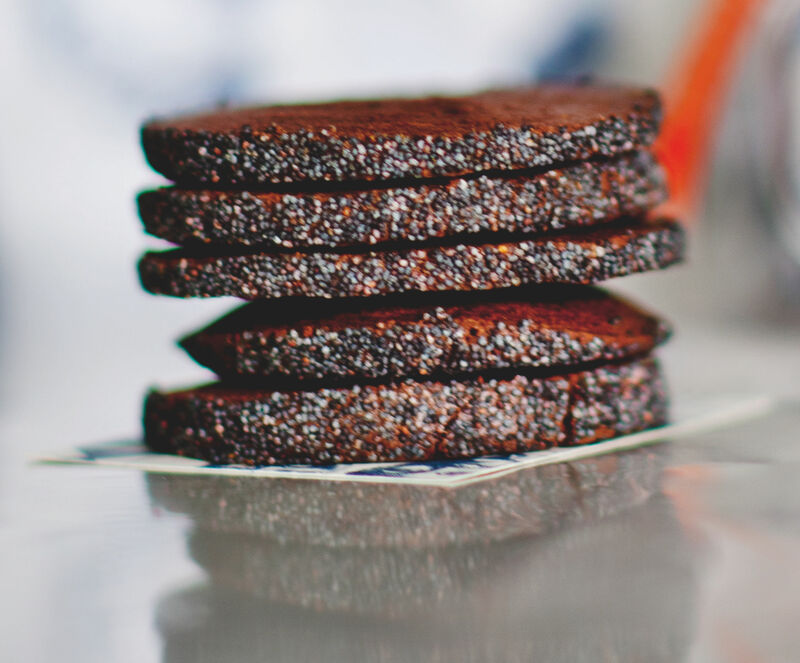 Incase you missed our chocolate infused supper club with Rococo Chocolates, here’s a tasty recipe (taken from their book – Mastering the Art of Chocolate) for their savoury chocolate biscuits that you can easily make at home. 1. Sift the flour, paprika, cocoa powder and baking powder into a bowl. 2. Stir in the grated chocolate, sugar and salt. Rub in the butter until the mixture resembles breadcrumbs, and then add 1 egg and mix to form a soft dough. 3. Roll the dough into a large sausage, about 5cm thick, on a well-floured surface. Beat the second egg and brush the sausage with a little of it before rolling the log on a tray covered with the poppy seeds. Wrap the log in cling film then transfer to the fridge for an hour to chill. 4. Preheat the oven to 160°⁄gas mark 3. Unwrap the log and, using a sharp knife, slice the log into 4–5mm-thick discs and put the discs, spaced apart, on to a large baking tray lined with non-stick baking paper. Bake for about 15 minutes, but don’t be tempted to overdo them. They will become firm and crumbly when they are cool. Leave to cool on the tray, then store in an airtight container for up to a week. 5. Wrap the biscuits in greaseproof paper with a beautiful hunk of cheddar to make a cracking gift for cheese-lovers. Photography by James Murphy. Extracted from Rococo: Mastering the Art of Chocolate by Chantal Coady. Published by Weidenfeld & Nicolson.